A missing work of art breaks the fourth wall. A museum is no longer a perfectly orchestrated series of objects hung or placed on display specifically for your cultural education, but rather shows what it is, regardless of your presence: an archive, a mausoleum, a home. Some things are here and some things are not, and that is beyond your control. It seems Eli and Edythe Broad’s revel in breaking this façade, with both museums in Los Angles and Lansing offering glimpses into storage. Initially this enraged me, as if someone showed you all of the money in their bank account, none of which you could have. My father noted that perhaps this was an educational moment that I’ve overlooked. As I’ve spent my life enjoying and working in museums, I know that museums are more than what’s on display… however, this Broad stunt still enrages me. Works of art that are out seem to either be out on loan or out for restoration. I am currently at an artist residency in Aarhus, Denmark, so perhaps, I too am out on loan… or out for restoration. There is a consistent connection between sports and the arts. Sports and the arts both receive cultural funding, and sports players, like art objects, also are “loaned out.” I don’t think any museum these days would loan out an artist, but museum’s don’t “own” artists… do sports teams “own” their players? Who makes the decision to loan something, or someone, out? But why call attention to what is out at all? Sasha Rose Richter, an independent curator based in Aarhus, told me that when a work of art was on loan or out for restoration at the Statens Museum for Kunst, she would just replace it with another. I assume that in cases where the work of art is a highlight of the museum, it is important to tell someone straight away, ‘It’s not here, stop looking. Don’t worry, it’ll be back.’ Furthermore, if it is only out for a short period of time, there is no need to perform the intellectual labor required to find a suitable replacement. 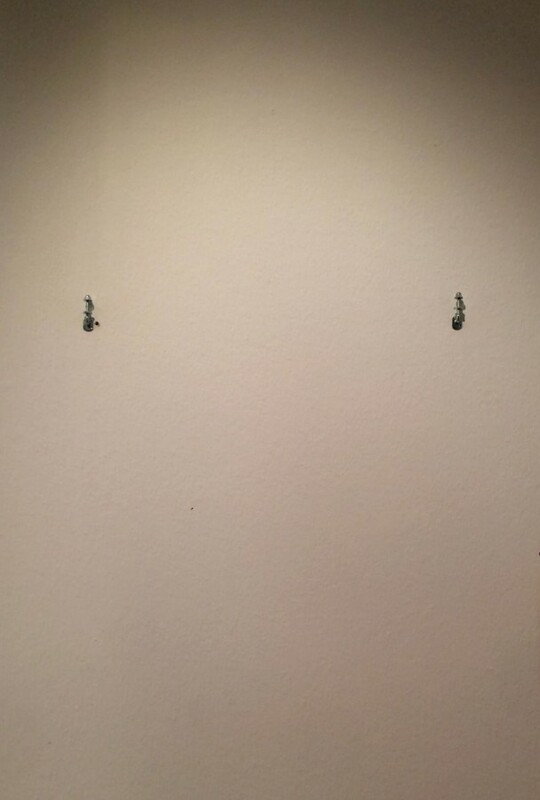 However, when I saw that not only was the work of art not replaced, but the hooks were not removed from the wall, and the holes made from previous hanging attempts were visible, I thought of the Detroit Institute of Arts financial instability. Did they not have a full-time preparator? This MUST be a distraction to museum goers, not just conceptual artists who are looking for any reason not to look at the “art” itself.